In GD&T, Symmetry is a 3D tolerance that is used to ensure that two features on a part are symmetrical across a daum plane. Put another way, Symmetry establishes a tolerance zone for the median points of non-cylindrical part features. 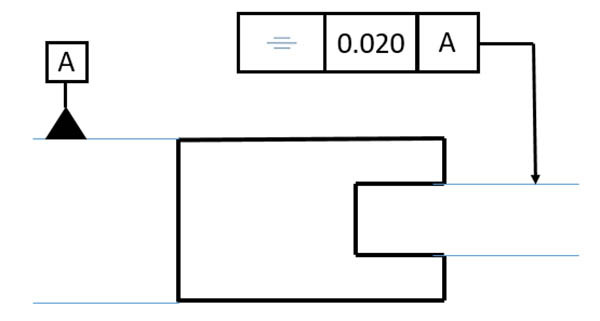 Those median points are the points halfway between the two features and must lie within a certain distance of the datum plane. While designers often create symmetrical parts, GD&T’s Symmetry may not be the best approach. Like concentricity, other tolerances such as position, parallelism, or straightness are preferred over symmetry because it’s difficult and time-consuming to establish median points with measuring equipment. Wherever possible, it is therefore preferable to use another form of GD&T tolerance. The Symmetry callout above is for a notch in a rectangular part. It species that the notch must be symmetrical about the Datum Plan “A”, which is a plane at the midpoint of the top and bottom of the part.. Continuing with the example above, Symmetry controls how much the distance between any median point and the ideal datum plane may vary, hence it establishes a tolerance zone that looks like two planes symmetrical about the datum plane and whose distance apart is the Symmetry tolerance. Every median point on the feature must fall within that tolerance zone. Measuring Symmetry is difficult because it relies on the measurement of a derived feature rather than on the measurement of an actual surface on the part. In practice, measuring Symmetry requires taking many measurements (as many as is realistic) to establish the theoretical central plane of symmetry. The surface must be mapped as well as possible and the median points calculated. 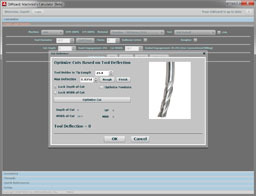 That process is so time consuming that typically Symmetry is only measured using a coordinate measuring machine (CMM) or other automated approach, such as a probe.